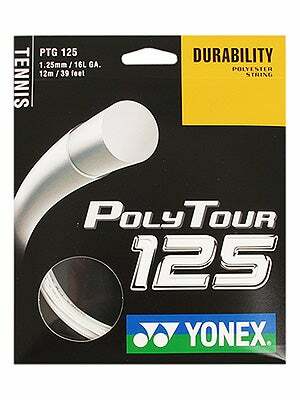 The Yonex Poly Tour 16L would be my first playtest of any Yonex tennis string. I didn’t know what to expect; especially since Yonex tennis strings are rarely in the conversation of performance tennis strings. Honestly, I chose this particular tennis string because of the price, I like a bargain when it comes to strings, for $8.00 it can’t be beat. Uncoiling the Yonex Poly Tour string was a major pain, because it’s a stiff polyester the coils held pretty tight. I found out within the first few main strings that this was going to be a string to give me problems while stringing. I got a lot of string twist and kinks when weaving and pulling, it was frustrating but I got the job done. Side note, I’ve veered away from pre-stretching polyester tennis strings after learning that doing so makes the string play less like it is supposed to play (stretching causes loss of resilience). Here’s where the Poly Tour confused me, on day one of playtesting the string I liked it. The string gave incredible pop, feel, and spin; hardly moving at all, and overall a good feeling tennis string. The Poly Tour allowed me to take big cuts at the ball,l where it felt like I was hardly making contact at all, it was very soft and forgiving. I was getting some pretty decent spin coming off the forehand side (my dominant spin side) while getting some really nice ball pocketing. Though hitting slower paced balls were an obvious struggle as the strings would not pocket the ball as much. Backhand slices were pretty sweet, very penetrating and biting down into the court made the highlight reel of the Poly Tour. Flatter groundstrokes weren’t all that bad either, I mean, I don’t like to hit flat but I do it for the sake of this string review, I was able to produce some really deep, penetrating flat strokes with this string. I was impressed…. I thought for sure this string was the string to have in my sticks (for the price especially); however, the story changed dramatically the second day of reviewing the Yonex Poly Tour. I don’t know what happened on the second day of reviewing the Poly Tour tennis string; I was playing at the same court, under similar weather as day one, with the same guys, and the same tennis balls from the night before; I just can’t seem to figure out how the strings changed so much. I looked forward to another couple of hours of play with this tennis string installed, but much to my dismay, the strings performed terribly. They felt really stiff and there was zero feel. I was blown away by the difference. Even when slowing my swing down, I could not get control of the ball and the strings were all over the place. The nail in the coffin for the string was how much it hurt my arm on day two; I actually had to stop halfway through my hitting session because my arm hurt like crazy. As soon as I got home, I cut them out…thankfully. Now, just because this string nearly broke my arm on day two, I was still really impressed with how it played on first day or right after stringing. Yonex is onto something pretty good here, if they were to go back and retool the durability of this string, it would be a great success for all players. Right now, as the strings stand, it is a must try string for the advanced player who wants a powerful polyester string but cuts them out after a match. I also recommend stringing this string about 15% higher than what you normally do, ya know, to hold off the movement of the strings for as long as possible.